The simple and most compelling reason is that people need to hear about the sin-forgiving, eternity-changing, hope-infusing, peace-giving gospel of Christ Jesus. Paul tells us that his primary focus was the gospel (1 Corinthians 2:1-5). It is the gospel that contains the power of God to bring salvation, freedom and rescue to sinners (Romans 1:16). There is no other way that a man, woman, boy or girl can have their souls cleansed but through an obedience to the gospel message (1 Peter 1:22). It is the good news of Jesus that saves sinners from eternal condemnation (1 Timothy 1:15; Romans 8:1). Simply put, people need to hear about this good news. However, as the late Carl F. Henry said, “the gospel is only good news if it gets there in time.” For that reason I go. Prayerfully, we want to see the awareness of international missions heightened in the congregation where we serve. To that end, we’re researching international opportunities that would be a good fit for our church. Currently, we have a partnership with Madrid, Spain as two members left several months ago to serve as missionaries there. Our heart is to have another partnership in an area of the world that is by-and-large unreached and unengaged. For that reason I go. Heaven and hell are real places and every person will live forever in one of those places. A million years from now the person who has been consigned to hell will still be there. I do not want to be a believer that functionally lives as if there is no such thing as hell, which is what is really going when people live their lives with an utter disregard of the eternal outcome to the people around them (i.e. don’t talk about Jesus).. I want God to break my heart for the world, the vast majority of which do not know Jesus. And as it stands eternal torment awaits them, not the eternal joy and life Jesus has purchased through the cross. For that reason I go. 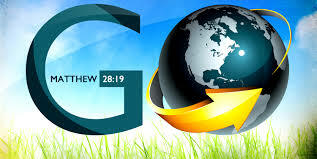 Jesus has commanded us to go (Matthew 28:18-20). Far too many Christians have seen this as an option or a suggestion but Jesus submits this not as a suggestion but as a command. A lot of Christians need to do some serious repenting of such flippancy to Jesus’ words! Jesus, our King and Savior, came to save the lost (Mark 10:45). Thus, we’re never more like our King and Savior than when we prioritize his truth and values and Jesus was committed to saving sinners and we should do the same…tirelessly, passionately and obediently. For that reason I go. ← Why am I spending the next 12 days in two Asian countries?